Without any doubt one of the most important events of the upcoming rally will be again Indian Motorcycle revealing its new 2015 models. So many expectations… For now, what we know for sure is Indian’s calendar of activities from August 4th to 10th in Sturgis with demo rides, product demonstrations, apparel sales, live music, and more. Events will be updated at Indian Events. Indian Motorcycle Display, 3rd & Lazelle St., August 2 – August 9, 9 a.m. – 5 p.m. daily. Motorcycling fans are invited to stop by and explore the Indian Motorcycle display in Downtown Sturgis to check out the entire lineup of 2015 models. The Indian Motorcycle exhibit will offer hands-on product demonstrations, apparel sales, accessory displays, and much more. The display will also feature the American Motor Drome Company with live “Wall of Death” shows where daredevils risk life and limb to thrill and entertain Sturgis attendees. Shows performed daily on the hour; starting on Sunday, August 3 at 11 a.m. with the last show at 5 p.m. Tickets are complementary, courtesy of Indian Motorcycle. Riders can also enter for a chance to win a 2015 Indian motorcycle. Indian Motorcycle Demo Experience, I-90 @ Exit 30, August 2 – August 9, 9 a.m. – 5 p.m. daily. at the Indian Motorcycle Demo Experience on I-90 at Exit 30. Rides will be led daily with the first ride leaving at 9:15 a.m., last ride at 4:30 p.m. Riders must be 18 years of age and must provide proof of endorsement along with a helmet and appropriate riding attire. For full details visit Indian Motorcycles. 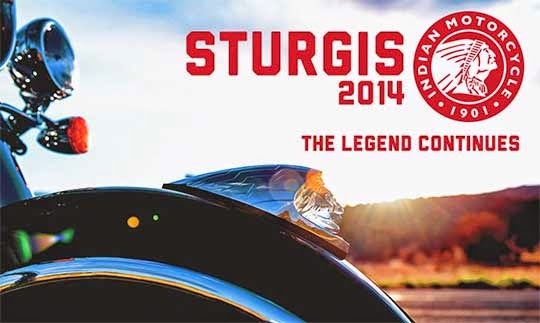 Indian Motorcycle @ the Crossroads at Sturgis Buffalo Chip, August 2 – August 9, 10 a.m. – 5 p.m.
Riders can also explore the new Indian Motorcycle display at the Crossroads to learn about the model year 2015 lineup, the brand’s heritage and sign up to win a 2015 Indian motorcycle. Admission to the Crossroads is free. Indian Motorcycle Night @ the Sturgis Buffalo Chip, Sunday, August 3, 8:30 p.m.
Owners of new and heritage Indian motorcycles will receive VIP treatment throughout the rally week starting with the Indian Motorcycle Owner Event on Sunday, August 3. Owners are encouraged to stop at the newly opened Indian Motorcycle Sturgis dealership from noon-2 p.m. for a complimentary lunch, followed by the opportunity to participate in any of a number of exciting planned rides. All owners are also invited to take part in Indian Motorcycle Night at the Sturgis Buffalo Chip for dinner and an evening of live music and enjoyment. Throughout the weeklong rally, Indian Motorcycle owners can present their key to receive a special complementary gift at the Lazelle St. display, sign up for the Indian Motorcycle Riders Group, and much more. Owners should watch their email for further details.